Good Morning and happy Tuesday! 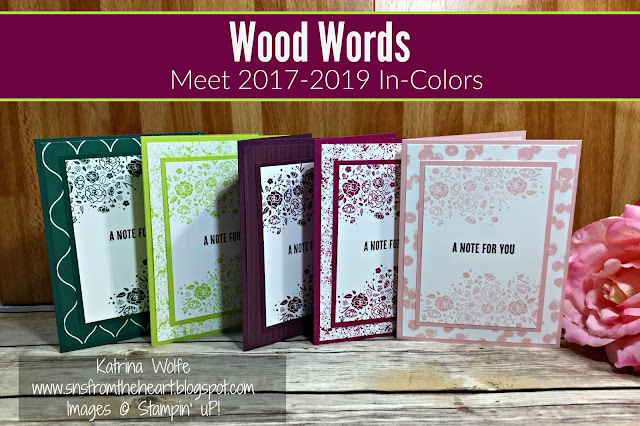 I have to tell you, I spent the weekend in my craft room playing around with new goodies, as I am preparing for my new Annual Catalog Launch party, and the more I play with these new In-colors, the more I fall in love with them. In today's cards, I created monochromatic examples using each of the new colors using the new stamp set, Wood Words, an awesome stamp set that ranks right up there as a favorite and I really hope you enjoy these as well. For each card, I began with a card base cut 8.5" x 5.5" scored and folded at 4.25" Then for the Tranquil Tide and the Fresh Fig card, I used coordinating colored DSP from the Eastern Palace Designer Series paper pack cut 4" x 5.25" and for the Lemon Lime Twist and the Berry Burst, I made my own patterned paper using the splatter image from the Touches of Textures stamp set and the Powder Pink I created the pattern using the dotted pattern from the Playful Backgrounds stamp set. I then cut a second piece of solid cardstock 3.25" x 4.5" and stamped the floral pattern from Wood Words stamp set onto Whisper White with the coordinating ink pad along with the sentiment from the same set in Basic Black and Fresh Fig for the Tranquil Tide card.